ANUSA’s SRC affirmed a vote of no confidence in NUS Queer/LGBTI Officer Jasmine Duff, who is affiliated with the Socialist Alternative faction. The no confidence motion was initially passed at the Queer Collaborations conference in June, following transphobic attitudes allegedly displayed by Duff at the NUS National Conference last year. ANUSA took part in a protest today against the new Prime Minister, Scott Morrison. The event was held in conjunction with the NUS and ANU’s Refugee Action Committee at Garema Place. An similar protest against Peter Dutton and the Liberal Government was held outside Parliament House on Friday. The ANU Disabilities Student Association held their annual Spoon Week this week. Events included a documentary screening, a roundtable on men’s disability and mental health, and a ‘Spooniversal’ Lunch Hour. Major issues have once again struck ANU’s network. 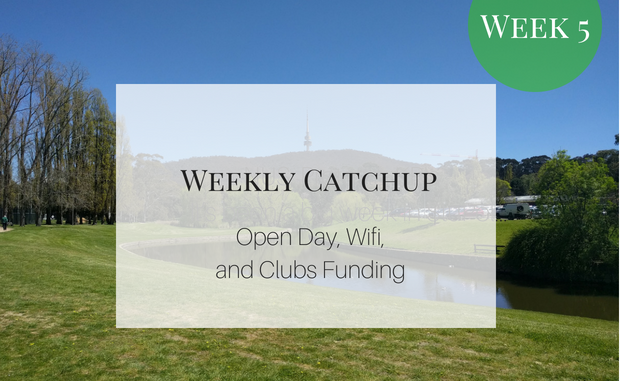 They began last Sunday night, with students having issues connecting to the ANU-Secure and Resnet wifi networks, and were ongoing throughout the week. Saturday saw Wattle, ISIS, and Echo360 go down, in addition to all campus wifi. The National University Theatre Society (NUTS) staged a production of Wit and raised money for Ovarian Cancer Australia. Director Chloe Harpley said that the play went “absolutely incredibly”, and particularly praised the audience response, letting the cast and crew know the work’s “poignancy” and “real impact on people”. So far over $500 have been raised, and the group is still accepting donations this week. ANU Open Day was held on Saturday. Observer’s stall was luckily located near Huxley the CASS dog. Prospective students were given the opportunity to tour the new Wright and Bruce Halls, but not SA7/new Fenner; there was also a virtual reality experience of the Kambri development. The Clubs Council made a number of changes to its financial policies, allowing for an increase in event funding. Subsidies will no longer increase with the number of attendees, but will be capped at $11 a head, the previous maximum. The Clubs Council will soon be getting a logo. One suggested logo resembles a tree, and incorporates elements of the ANUSA and PARSA logos. 2019 pricing was released for halls of residence. Wright Hall will cost from $400 per week, Bruce from $423, and Fenner from $290 in its new home at SA7. Applications for transfer and readmission have been overhauled, and will now be conducted entirely online. The PARSA election campaign continued, with a presidential debate between candidates Zyl Hovenga-Wauchope and Michel Watson held on Tuesday night.